Moroccan Arabic, also known as Darija, is Morocco’s major native language. It is different from most other versions of Arabic, but most Moroccans will understand the other versions. About 85% of people in Morocco speak or understand this language. It is similar to versions of Arabic spoken in other North African countries, like Algeria. Moroccan Arabic dialects also differ in rural to urban areas, due to different patterns of settlement. Standard Arabic is the official language, and is understood throughout Morocco. This form of Arabic is standard in the majority of Northern Africa and the Middle East. Most television programs that air in Morocco are in Standard Arabic. Hassaniyya Arabic is also known as “Moor.” Around 40,000 people who live in Southern Morocco use this dialect. This form of Arabic is spoken by less than 10,000 people, and is confined to small, secluded areas in the country. Tachelhit is a form of the Berber language. About 3-4 million people in Morocco speak it. It is conectrated in the Soussis area in the south-central part of the country. This is another Berber language, spoken by about 3 million people. It is concenrated in the center of the country. This version of Berber is spoken by approximately 1.5 million people. It is concentrated in the Rif area in the northern part of the country. 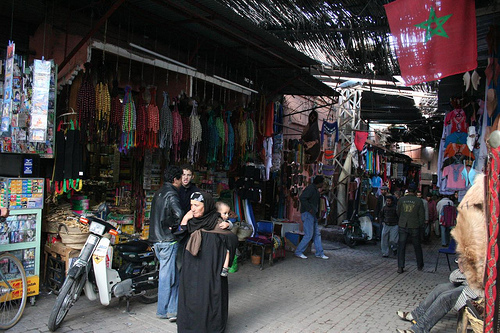 Despite its proximity to Spain, only about 20,000 people in Morocco are capable of speaking Spanish. About half of the people in Morocoo are capable of speaking some French. It is an unofficial second language. The French used to have a strong influence in this country in the first half of the 20th century. After the French left, a process of “Arabization” occurred, but the language still remains. French is commonly used in the government and in economics, as well as in education. Though less common than Spanish or French, a growing number of Moroccans are beginning to speak English. It is becoming more common amongst the educated youth in Morocco. Many people who work in the tourist industry are capable of a few languages, and English is usually one of them.